Three species of amphibians thought to be extinct for decades have been rediscovered, scientists announced Wednesday. The three are the cave splayfoot salamander from Mexico, the Mount Nimba reed frog from the Ivory Coast and the Omaniundu reed frog from the Democratic Republic of Congo. The three were found as part of an effort by Conservation International and the Amphibious Specialty Group of the International Union for Conservation of Nature to determine if 100 “lost” amphibian species are really extinct. "These are fantastic finds and could have important implications for people as well as for amphibians,” said Robin Moore, who organized the Search for the Lost Frogs, the official name of the campaign. The creatures could help in medical research or just in protecting water resources, Moore said. Several specimens of the salamander, of which only a lone individual was identified in 1941, were found in a system of caves accessible only by a pothole in Mexico’s Hidalgo province, Conservation International said. The Mount Nimba reed frog, found by a local scientist in a swampy field near Ivory Coast’s border with Liberia, hadn’t been seen since 1967. 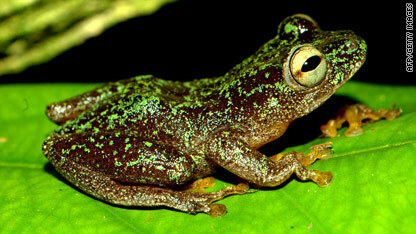 The Omaniundu reed frog hadn’t been observed since 1979. It was spotted in a flooded forest next to a Congo River tributary. The first phase of the lost frogs project continues until next month when the Convention on Biological Diversity opens in Japan. Scientists hope they’ll have more successes to announce then, but Moore said it’s a tall task. “These rediscovered animals are the lucky ones – many other species we have been looking for have probably gone for good," he said. This is the most influential topic that I have read this year?? ?